There is nothing that relaxes me more than listening to my wind chimes. I have several because I can never decide on my favorite sound. Each one offers such a beautiful melody and depending on what it’s made of, it could be deep or angelic. 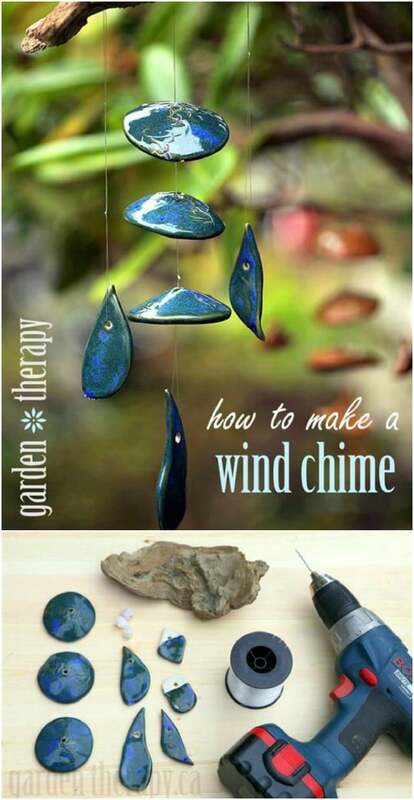 There’s just so much beauty in wind chimes that I thought maybe you all would like to make your own. So, I got busy and collected 40 of the most beautifully sounding wind chimes that you can make yourself. These not only sound beautiful but they look great as well and they’re easy for you to DIY. 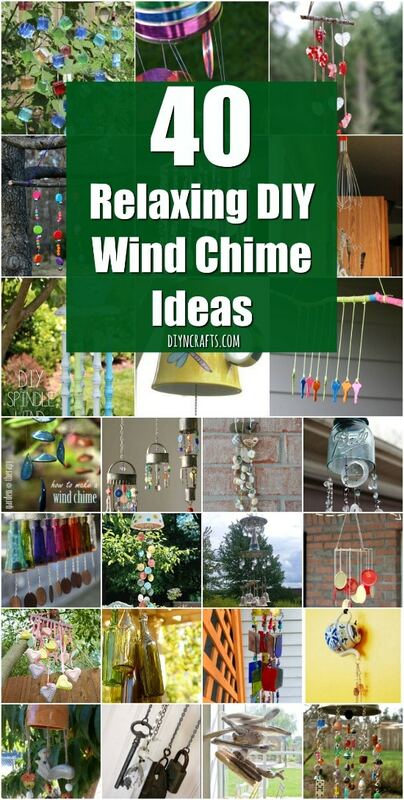 If you love wind chimes, too, then you are definitely going to love this project collection. 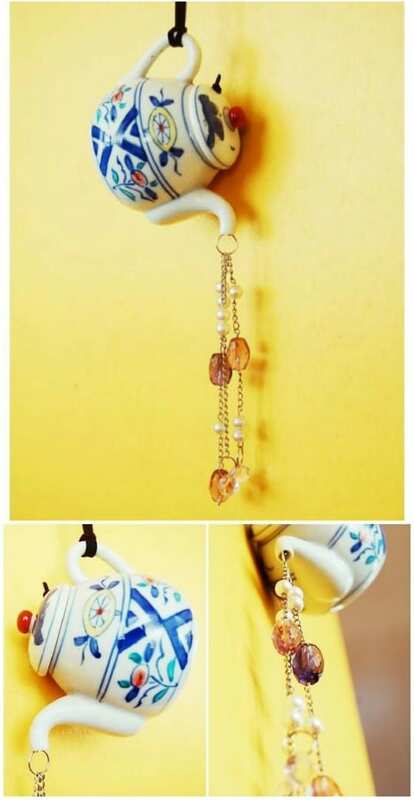 From vintage teapots and cups to bamboo and bottle caps, there is a wind chime in here that you are sure to fall in love with. 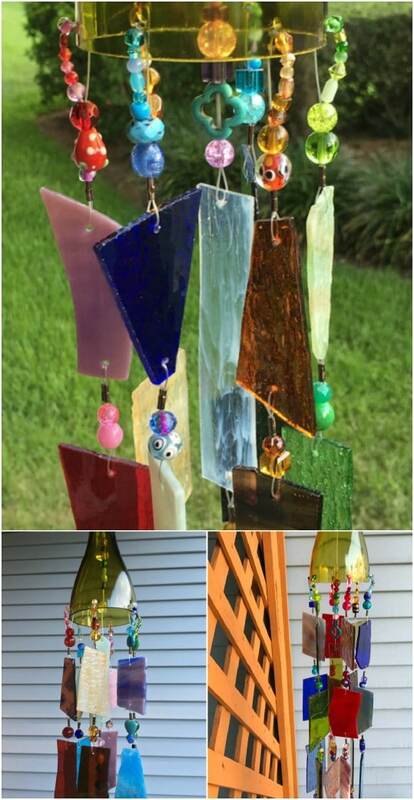 Many of these are completely made from scratch so they won’t cost you much at all and some are repurposed from other items, again, a cheap way to get a beautiful and relaxing wind chime, right? You know how much I love to repurpose and to add beauty to my home and garden. Just take a look at these 20 amazing ways to repurpose old chairs. This is still one of my favorite repurposing lists. Wind chimes are always a wonderful gift, too. If you have an upcoming wedding or someone special is having a birthday or wedding anniversary, you can totally make a wind chime for them and I promise you they will love it. Wind chimes have always been among my favorite gifts to receive and they are perfect when you need to buy something for someone who seems to already have everything. You’re also going to want to check out these 50 jaw dropping ideas for upcycling tin cans. There are wonderful gift ideas in there, as well. So if you’re ready, we’ll take a look at some of the most gorgeous wind chimes you’ve ever seen. You can easily make these in an afternoon and some won’t take longer than an hour. When you’re finished, you’ll have beautiful wind chimes that will instantly improve your outdoors and give you a wonderful sound when the wind gently blows. You can turn an old metal teapot – or coffee pot for that matter – into a gorgeous wind chime that sounds amazing when the wind blows. The chimes on this one are old spoons and other silver cutlery which has a beautiful sound when it clinks against the teapot. 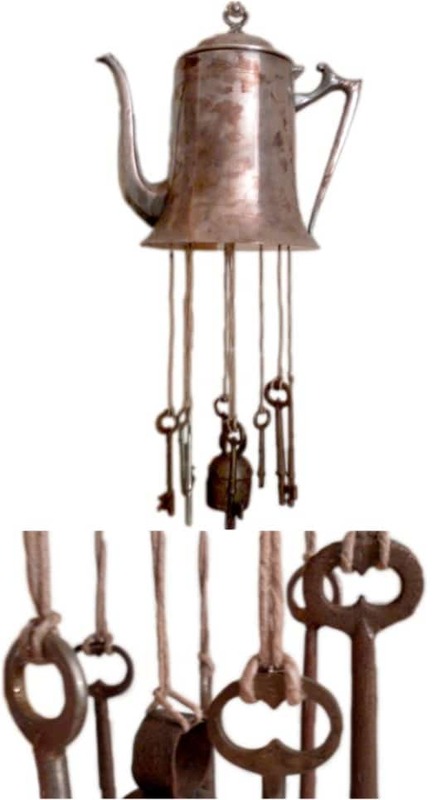 Tie your chimes to the teapot with hemp, twine or regular rope and sit back and listen to the wonderful sounds it makes. You can save bottle caps from drinks or buy them at most craft stores. 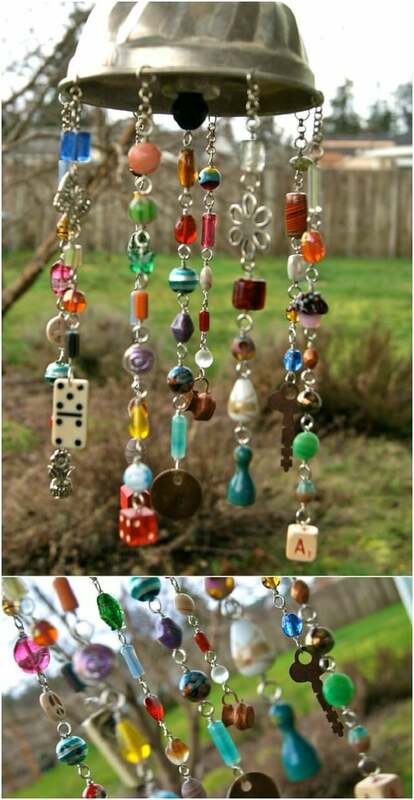 When you have a few, turn them into a gorgeous wind chime. I’ve seen this done in many ways and all of them are great. If you want a more vintage look, leave your bottle caps as they are. If you prefer something more modern and colorful, you can spray paint each one. Then just string them all up together and add any decorative properties that you want. This heart made of chains is not only rustically beautiful; it also gives off a wonderful sound when the wind hits it. You make it with an old chain, some metal for the base and a wooden post to show it off. 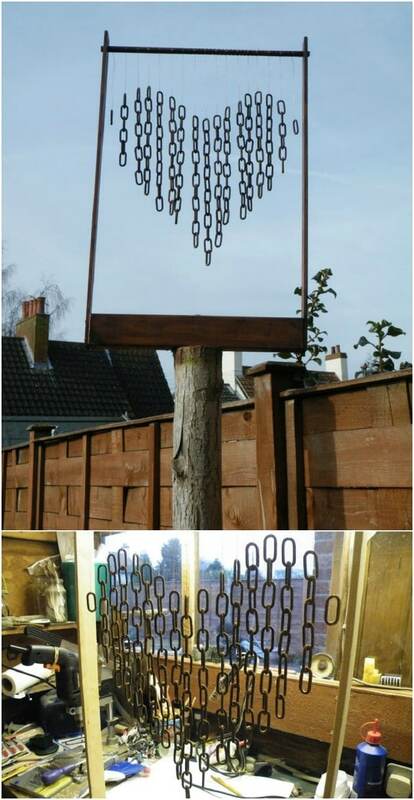 This is a really easy project to do, and it’s a unique take on the traditional wind chime. You could do this in any number of shapes to make it more unique. This beautifully colored wind chime is made with an inverted terra cotta planter and the chimes are made from colorful glass shells. You can find these at most hobby or craft stores. The shells are tied together with invisible cord or you could even use fishing line if you already have some on hand. This entire project costs less than $20 and that’s if you have to buy everything. Sun catchers are gorgeous, especially when they’re combined with a wind chime so you get beautiful colors and sounds. You can completely make this one yourself from melted plastic and beads. You melt the plastic yourself, which you should do outdoors if at all possible so that you’re not smelling that horrid melted plastic smell. When it’s finished, this is a gorgeous sun catcher that is filled with color. You can make this natural wind chime from a branch or piece of driftwood. The chimes are organic clay shapes, which you can pick up at any hobby or craft store, or make them yourself. This one offers a beautiful melody and would be perfect to hang in the garden or on the back deck, wherever you want to add some natural beauty. This beautiful chime is made from all driftwood, so the sound you get is more of a deeper clank than a metal bell sound. It’s a pretty easy project, too. You’ll need driftwood and then a drill to make holes. 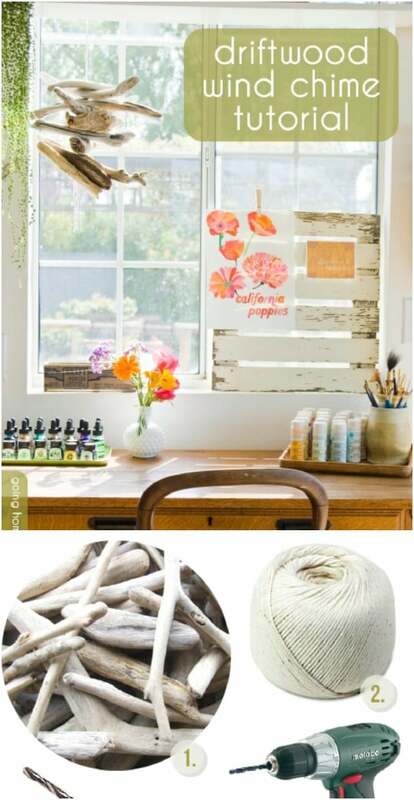 You just string the driftwood together with rope or twine and then hang it on the porch for a lovely natural sound. 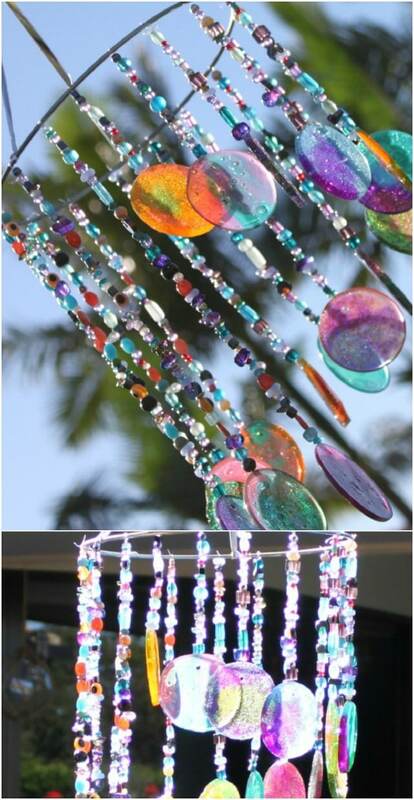 This stained glass sun catcher and wind chime is gorgeous and it gives off a lovely sound. It’s made with stained glass squares that are tied together with beaded cord and they hang from a wine bottle. I found this one on Etsy for around $60 and it’s made from an upcycled wine bottle and has more than 26 pieces of stained glass overall. 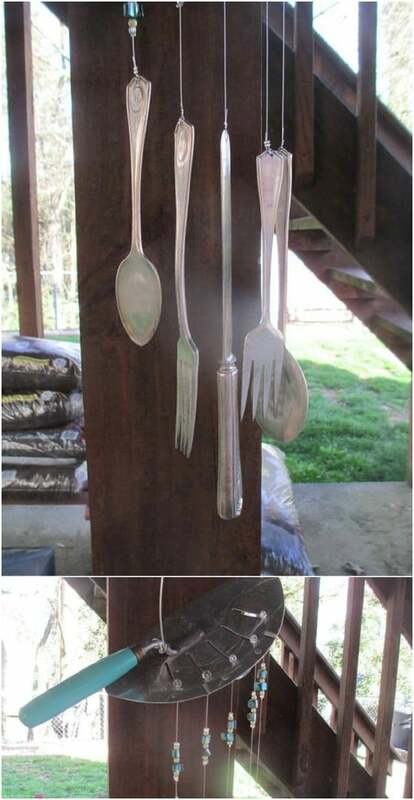 You can create a beautifully sounding wind chime and upcycle that old flatware at the same time. If you have some old silver spoons and forks that you aren’t using any longer, you can turn them into this lovely wind chime with some fishing line and a few other key supplies. This one is as rustic as it is lovely and is perfect if you’re looking to add a farmhouse quality to your outdoors. 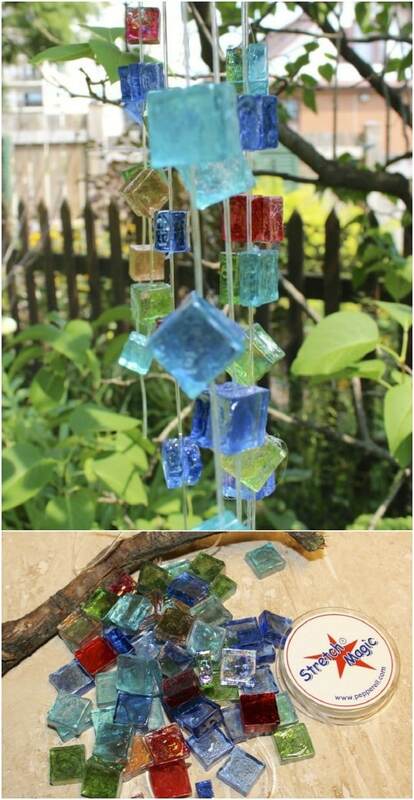 Glass tiles give this wind chime a lovely sound when the breeze hits it. This is a really easy one to make and for the base, you can just use a small branch or piece of driftwood. You just drill a hole into the glass tiles, just large enough to fit the line through and then hang. You have a lot of creativity with this one too, depending on the actual tiles and colors that you buy. This is a wonderful way to preserve some memories and create something new at the same time. 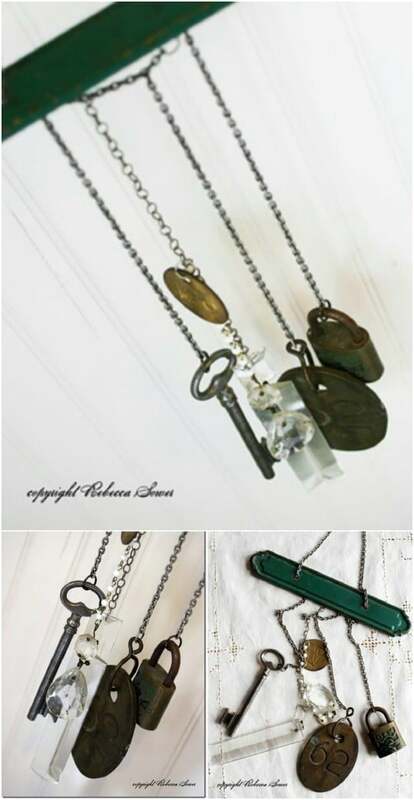 This vintage treasures wind chime is made with old keys, jewelry and other items that all fit together perfectly. Just look around and see what you have on hand that might make a wonderful sound when in the breeze and put it all together to see what you can create. 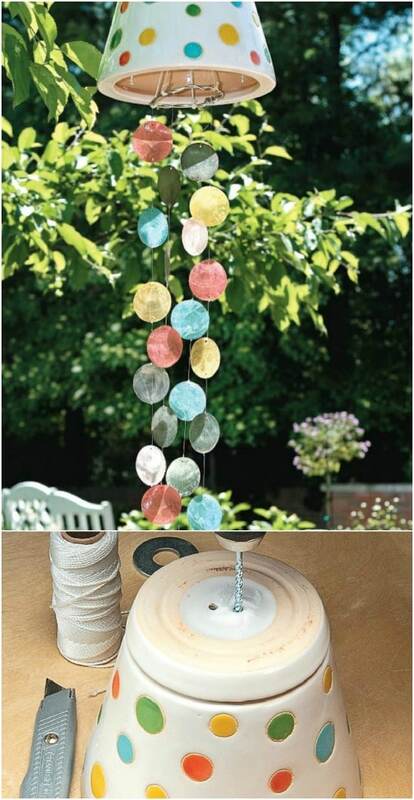 Turn those old mason jar lids into a beautiful wind chime this summer. 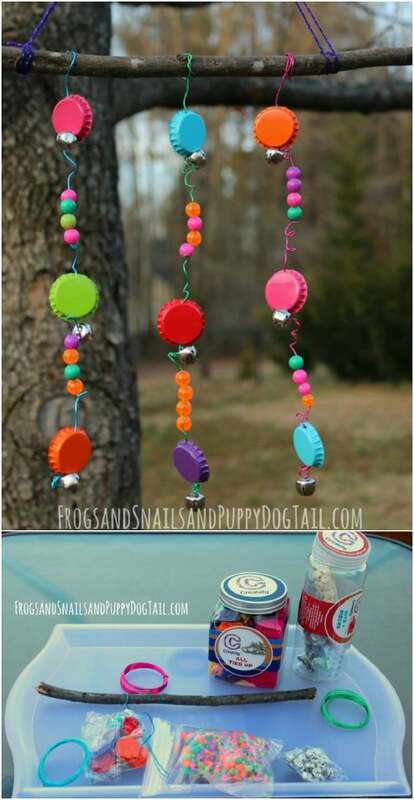 This is an excellent craft for the kiddos when they get bored over the summer. Just paint the lids from your old canning projects and drill a hole big enough to fit some twine through. Then just string them all up and attach to a base of some sort. An embroidery hoop works perfectly for the base. 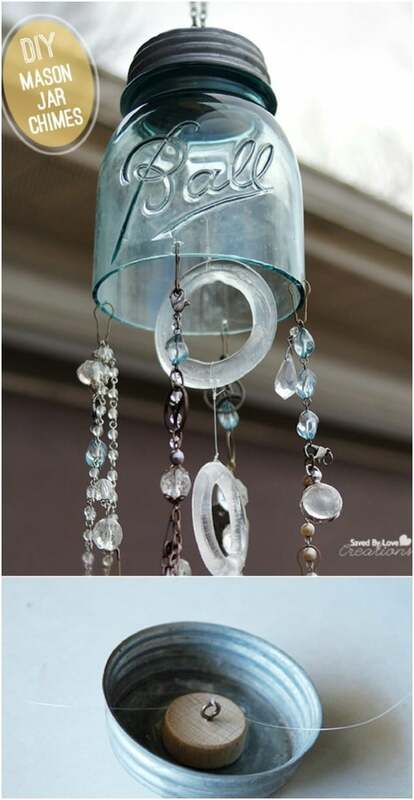 An old mason jar can be cut in half to make a lovely vintage wind chime. This is the perfect chime if you’re looking for that country look and it’s really elegant with beads and other pieces flowing down from it. The jar works as the base and glass beads and old costume jewelry can be used to make the chimes. 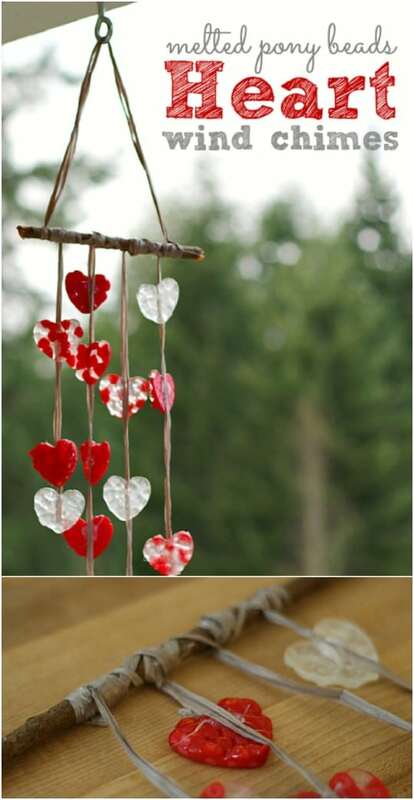 This lovely heart wind chime is made from melted beads. You can put the beads in a silicon mold and then bake them to create your shapes. This is an excellent project for little ones. 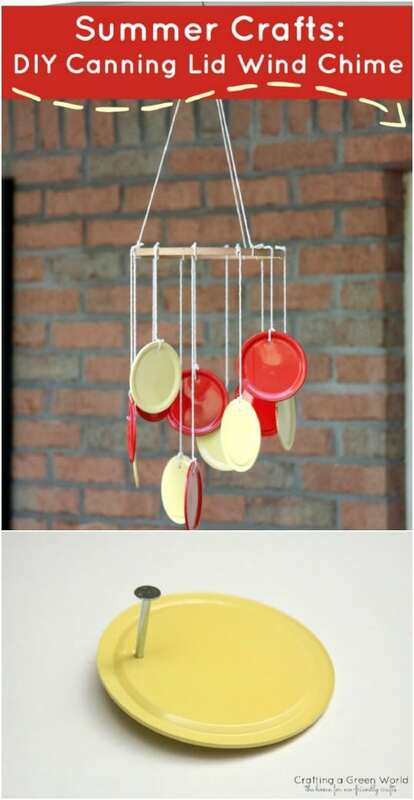 They can help to fill up the molds and even choose the colors that they want to use to make their wind chime. What do you do with an old baking tin and some game pieces? You make a wind chime out of them. I love this idea! The base is an old bundt pan, although you could use any number of things for this. The chimes are game pieces like dice, monopoly pieces, dominoes, and others and they’re strung together with fishing wire with a few beads thrown in for beauty and sound. 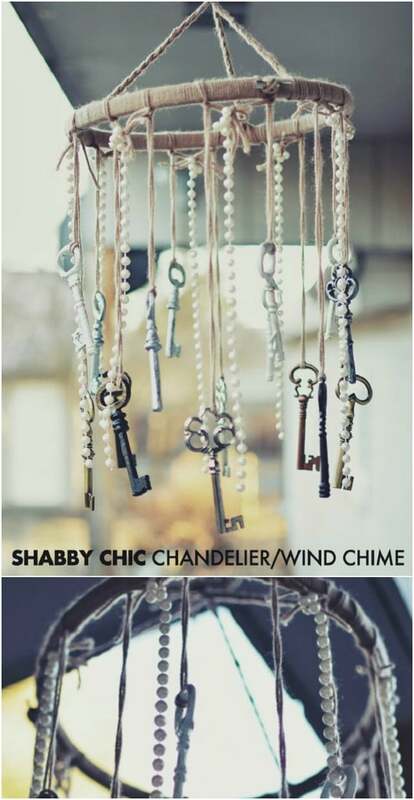 This shabby chic wind chime uses old skeleton keys and faux pearls to give it a very unique look. The keys sound beautiful when they blow in the wind and the entire chime is just gorgeous. If you want something elegant with just a little kick of creative, this is definitely an idea for you to try. And, if you don’t have any old skeleton keys, you can pick them up at flea markets and thrift stores for less than a dollar each in most cases. You can literally make something out of anything. This pot strainer wind chime is proof of that. The base is a vintage pot strainer and the chimes are made of silverware or other old kitchen utensils. It has a wonderful rustic farmhouse look that I love and sounds amazing in the wind. I saw this one on Etsy and knew that I had to share it with you. You can pick it up for around $18. 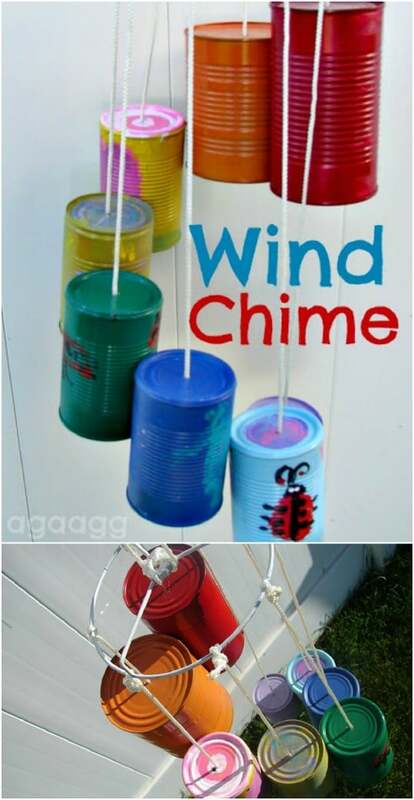 This colorful wind chime is the perfect thing for kids to make when its rainy outside. You make it from keys that are painted all sorts of bright colors and tie the keys to a branch or stick with ribbon. If you’re like me, you have all sorts of old keys that you don’t use anymore – because you don’t know what they go to. 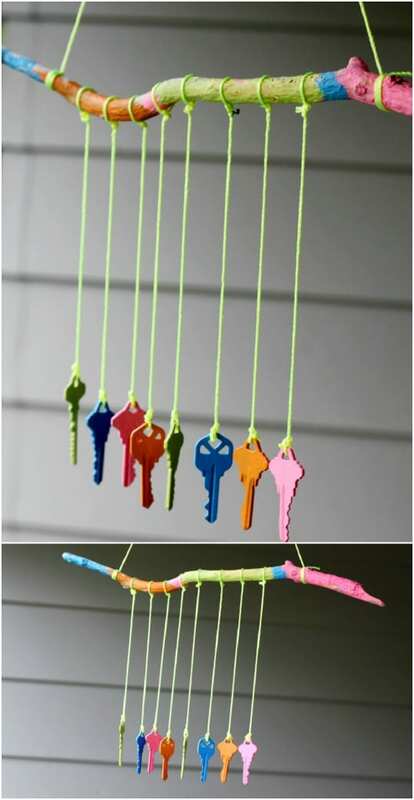 This would be the perfect way to put those otherwise useless keys to good use and give the kids a craft to keep them busy. A few terra cotta planters make a wonderful wind chime when you add some string and a ringer. You can choose any number of things to make your chime. The beauty of this project is in the terra cotta base. Paint those pots to match your outdoor décor or to make a really great contrasting statement. This entire project shouldn’t cost more than $10 if you have to buy everything. 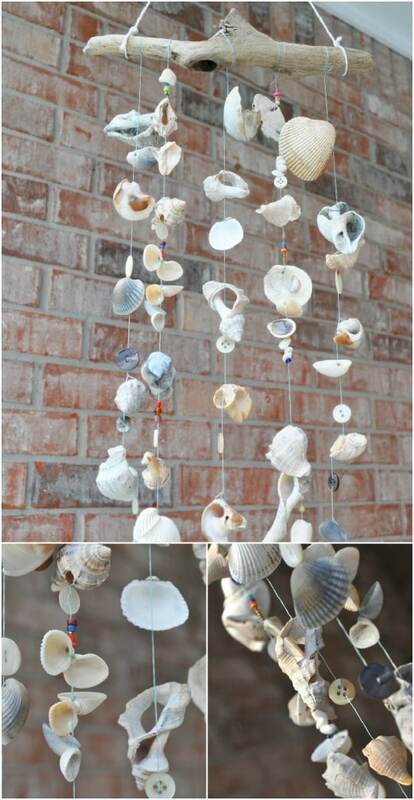 If you love the beach and you want to bring some of it home with you – if you aren’t lucky enough to live on the coast, that is – this seashell wind chime is perfect. Gather up those shells the next time you go on vacation or you can buy bags of shells at craft stores and sometimes at the Dollar Store. 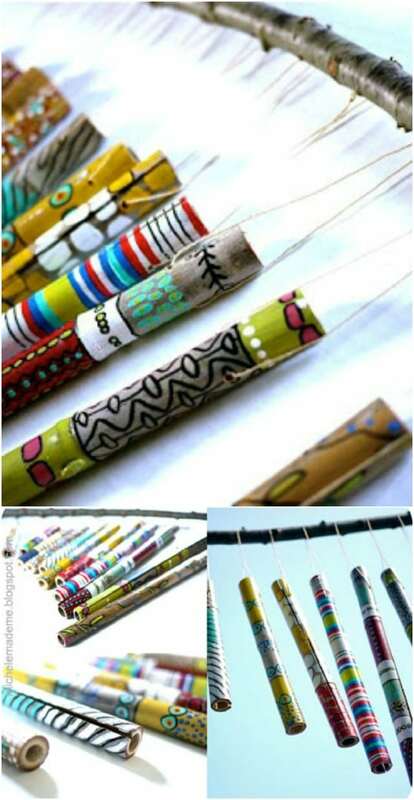 String them up with fishing line and attach to a piece of driftwood and you’ll be reminded of those beautiful waves every time the wind blows. 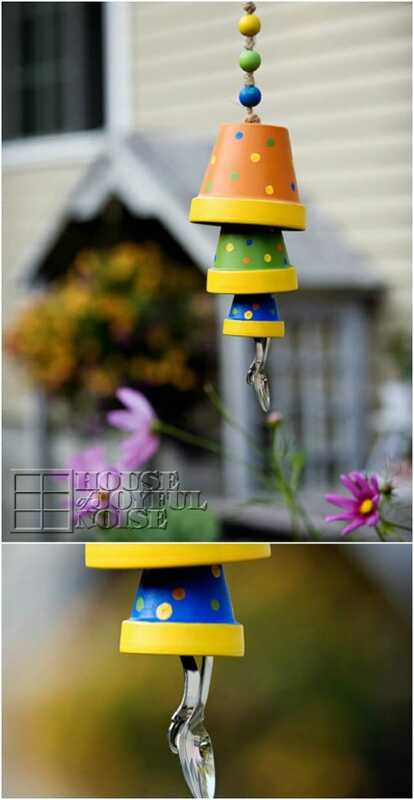 This upcycled tin can wind chime is great. Not only is it lovely to look at and beautiful to listen to, it helps you to use up some of those empty tin cans that you would otherwise throw in the trash. I love anything that helps me to turn trash to treasure and this wind chime is certainly a treasure. Gather up your cans and let the kids help you paint and decorate them. Then just string them up and you’re all set. I love bamboo wind chimes. I think they offer the most relaxing sound but they can be a bit expensive. Unless you make this DIY version, that is. If you live where wild bamboo grows – we have a lot of it here in the South – then you can make this for nothing. If not, then you can buy bamboo sticks at most hardware or home improvement stores or even hobby stores. You’ll love the sound that this one makes when the wind hits it. 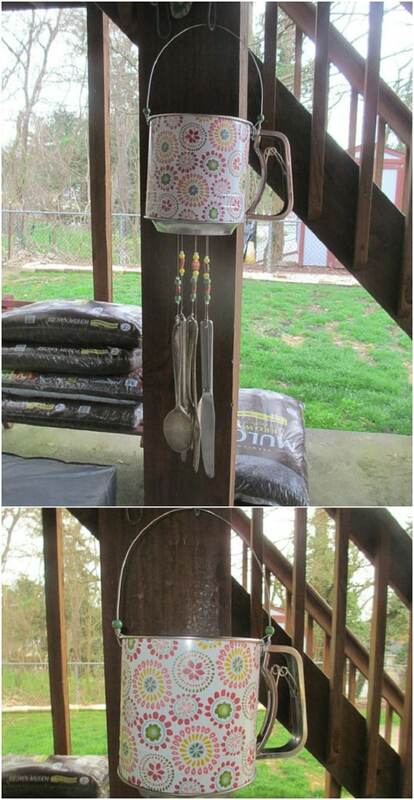 This wind chime is made from an old flour sifter and some silverware. It has a wonderful rustic quality to it and decorative beads to give it color. I love the idea of putting that old flour sifter to use – I have one that I’ve been wondering how to repurpose. This little gem is on Etsy for $18, or you could totally DIY it if you wanted. 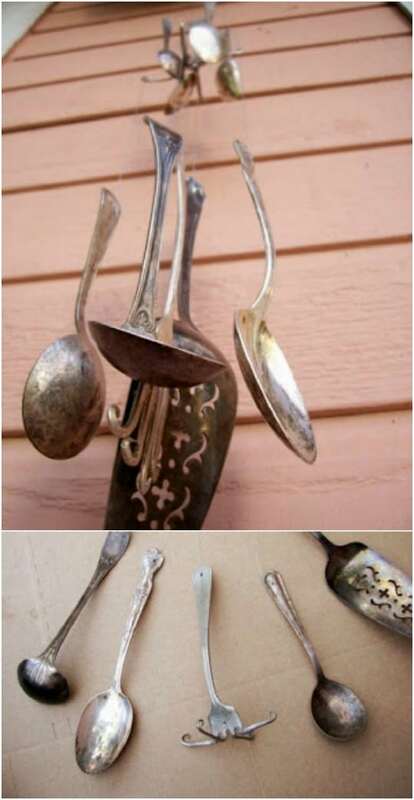 Just find an old sifter and a few old pieces of silverware and put it all together. I love decorating with vintage teacups and saucers. 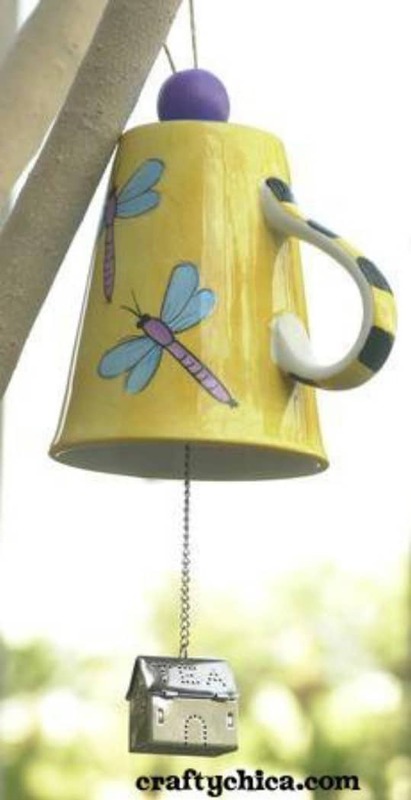 This little wind chime is just another wonderful way to repurpose that old china and make it new again. You just use the teacup as the base and then add the string with your bell or something that will give a nice chime when the wind hits it. I think gluing the saucer to the bottom of the cup before you turn it upside down would also look really nice.